One of my goals this year was to stop worrying about things so much. I listened to Let it Be earlier this week – it’s my favourite Beatles song and I like the sentiment of letting things happen the way they will and not stressing so much. It’s almost a peaceful thought – going with the flow, feeling calmer, trusting that things will be okay. I can only hope to get better at doing this. I had a slip up already though. I was chatting to a writer about submitting to publishers and I had a sudden panic about the prospect of it happening. I felt fear. I described it as a writer freak-out on Twitter. I instantly had empathy from other writers – we do seem to be a neurotic bunch at times 🙂 But recognising it felt like the first step in overcoming it. There was no point in my anxiety. When my book goes out to publishers I will have done the best I could do – I have worked hard on it, I wrote the story I wanted to and I found an agent who believes in the book and will fight for it in the marketplace. I can’t do anymore. These words seemed really fitting this week. 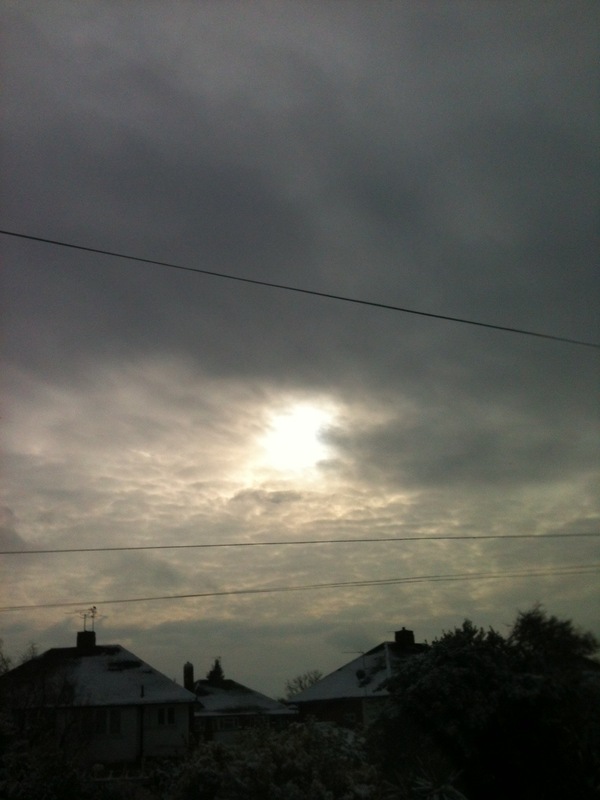 I spent the weekend feeling melancholy as I looked out at grey skies and a snowy landscape. Because everyday when I feel fear, I know that there will be another day when I don’t. If my book does find a publisher, all the angst will be worth it. I just have to believe that it will be happen. This is my dream, I have chosen this path and I need to focus on when, not if, it comes true. I looked out of the window on Monday and saw the sun was breaking through. Relieved, I snapped a picture of it. I think it shows that tomorrow will always be brighter. There will always be light after the dark. There will always be blue skies on the horizon. I just have to let it come when it’s meant to come. How good are you at letting things be? Seriously, you’re determined to make me cry, right?!! I’m terrible, absolutely terrible. So I can’t help I’m afraid! haha. I’m bad at it. Not only can’t I let things be, I stress about things that already were, thing in the past that I cannot change. I need to Let it Be. Great post as usual. Ah yes, the regrets of the past I know this well. We do like to torture ourselves 🙂 Thanks Lisa! Sometimes I look back and think of how I could have improved the product. I am still polishing my first. I am a perfectionist and don’t want to waste anyone’s time. I don’t know how hard I’ll be on myself. Time will tel..
Ah the old “what if”. All you can do is the best you can then go with your gut. I always used to be on one of the two ends of the spectrum here. Either I’m going crazy, shaking, yelling, and completely freaking out, or I just don’t give a you-know-what. I’m trying to be more in the middle. These days, I tend to do whatever is my part, and then forget about it. Seriously. I make notes in my planner to remind me about things I’ve done and things I may need to follow-up on. That’s how good I’m getting at letting things go and forgetting about them for a time. Lol. I like the way you handle it. I need to let things go better. I shall try! Nice ideas here. I am terrible at letting things be…. I’m a worry-wart and get hot under the collar far too easily. Sounds like a lot us writers are worry-warts 🙂 Good luck working on letting things be too! I try to remember how far I have come. I tell myself I have come a lot farther than how much farther I still have to go. It helps to keep my nerves steady. That’s a great idea, I will try it! I admire the way you deal with it, I will try to take a leaf out of your book! Haha I do a lot of freaking out 🙂 Good for you!